For the first-time visitor or the resident who’s not so sure he or she has seen it all, here is the basic list, otherwise known as “Abby’s Mini Guide to Paris”, which also includes some excursions out of the city. Click on the image below to purchase a print-ready version! • 11th & 12th: Bastille (the narrow cobblestoned Rue de Lappe with a number of bars and restaurants, especially Latin American cuisine, and the cute cobblestoned Cour Damoye) and Marché d’Aligre (large open-air market). Also République (bars and clubs at night), Parc de Bercy and Bercy Village (where rows of 19th century wine warehouses have been restored as shops and restaurants). • 16th: Go to Trocadero for a great view of the Eiffel Tower across the river, especially at night. One of the more posh neighborhoods—nice to stroll around the tree-lined avenues (for example, ave Victor Hugo) and admire the architecture. • Neuilly/Ile de la Jatte: Neuilly is one of the poshest suburbs of Paris. Similar to the 16th, it’s nice to stroll around the tree-lined avenues on a sunny day. Ile de la Jatte is an island in the Seine with some cute houses, a few cafés and a nice park at the northern tip. Here are just the main art museums I’d recommend, but you can find all the museums in Paris by clicking here. 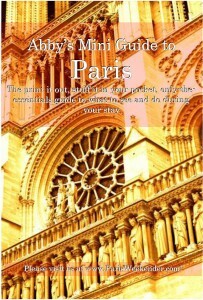 Pick up a Pariscope guide from any kiosk (40 cent) for information on temporary exhibits. • Rodin Museum—best in nice weather when you can enjoy the garden. • Pompidou Center (modern art)—go in part to see the building. Be sure to go to top floor for the view of Paris, especially at night. • For some lesser visited museums consider the Musée des Egouts (sewer museum), Musée du Vin (wine), Institute du Monde Arabe (museum of Arab culture), Musée Carnavalet (history of Paris), Musée d’art et d’histoire du Judaïsme (Jewish art and history museum), Quai Branley (museum of primitive cultures), Maison Européenne de la Photographie, Fondation Cartier (modern art), Musée Marmottan Monet (impressionists). • To see artists at work visit 59 rue de Rivoli in the 1st (formerly squatter artists, these studios are now legit and open to visitors or Le CENTQUATRE in the 19th. Do not miss out on the January (late January to mid-February) and summer (late June to late July) sales! —St. Germain (rue de Rennes, Cherche-Midi for smaller boutiques, blvd St Germain itself). Check out my favorite little (affordable) art gallery, Carré d’Artistes (there are also branched in the Marais and Montmartre). —Bon Marché on the Left Bank (and don’t miss Le Grand Epicérie, the high-end international food market). • Marchés. There are many open-air markets all over the city, generally a couple days a week in the morning until 1pm or so, though. It’s the best place to buy fresh fruit and vegetables and olives, cheese, etc., but also random items like scarves and tablecloths at a discount. Below are a few of these markets. For locations and opening days and times for all (nearly 100) open-air markets in Paris, click here. —Rungis—the huge food market by Orly airport where restaurants get their supplies. Best to go super early in the morning Tues-Fri (fish market opens at 2am, other markets at 3am, 4am, 5am). Best by car (€8 toll) or there’s the 216 bus from Denfert-Rochereau. Technically, you’re not supposed to walk in on your own, but go to La Marée restaurant by the fish market, have a seafood platter for breakfast, and they’ll give you the requisite white coats to enter. • Marché aux Puces (huge flea markets) at Saint-Ouen or at Porte de Vanves. • Sunday Night Dinner! For over 30 years, American Jim Haynes has been hosting dinners at his home in the 14th. • Check out this website for finding good restaurants based on neighborhood, theme, etc. and with good photos of each restaurant. • Or this site for Seine-side dining click here. • Bateaux Mouches (boat trip) on the Seine: very touristy but you have to do it once! Or there are boat tours of the Canal St. Martin and Bassin de la Villette: click here or here. • Concerts: most of the churches around Paris have frequent classical music concerts. Look for the posters, especially around the Latin Quarter (rue de la Huchette) or pick up a Pariscope guide from any kiosk (40 cent) for concert times and all the information imaginable on that week’s events in Paris (opera, museum openings, shows, concerts, movies, etc.) New Pariscopes come out on Wednesdays. The Church of the Madeleine seems to have free classical music concerts at 4pm each day. There are also frequent music festivals (jazz, etc.) around town—check out Pariscope. There are also a number of jazz clubs, for example, Caveau de la Huchette. • Wine Tasting: at O Chateau (highly recommended!) or the Museum of Wine. Also check to see if there is a wine fair in Paris when you are visiting—I highly recommend them! For example, Mer & Vigne hosts several wine fairs each year. Or do it yourself Wine Tasting at Wine by One (9 Rue des Capucines in the 1st). • Montmartre Vineyard. It’s not generally open to the public, but O Château (wine tasting) runs tours every day at 3pm. • Cooking classes: Spend a few hours one afternoon learning to cook French food (and then eating it!) One school whose pastry class I enjoyed quite a bit is Cookin’ with Class at 21 rue Custine in the 18th. • Photography classes: For those who speak French and want to see Paris from another perspective (while honing their photography skills), sign up for a 4-hour session with Je veux être photographe for €85 (approx. 1 hour of instruction, 2 hours of shooting photos in the chosen location in Paris, 1 hour of critique). • Cemeteries: Montmartre, Montparnasse, Père Lachaise are the major ones. • Explore the parks in the nicer weather: Jardin de Luxembourg (6th), Tuileries (1st), Jardin du Palais Royal (1st), Jardin des Plantes (5th), Bois de Boulogne (west of Paris), Bois de Vincennes (southeast of Paris), Garden of the Rodin Museum (7th), Champ de Mars (7th), Parc Monceau (17th), Parc des Buttes Chaumont (19th), Parc de la Vilette/Basin de la Vilette (19th) for movies in the park on a giant inflatable screen on summer nights, Parc de St. Cloud (Boulogne), Parc de Sceaux (Sceaux, take RER B south to Parc de Sceaux station, about 30 minutes from St. Michel). • Walking tours: Paris Walks give good tours in English—about 2 hours for €12 rain or shine, generally no reservations needed. We went on “Paris during the Occupation and Liberation” (around Tuileries, rue Faubourg Saint Honoré and the lower Champs-Elysées) and “Writers of the Left Bank” (around St. Michel and the Luxembourg Garden) and they were both excellent. Or follow your own walking tour—some suggestions: the Latin quarter, St-Germain-des-Prés, the Marais, Montmartre, along the quais of the Seine and the two islands, Canal St. Martin, the Viaduc des Arts (starts from behind the opera house at Bastille), any of the parks. • Running/rollerblading: Check out this site for running routes in parks in the Paris area. The quais are closed on Sundays and make a great spot for running or rollerblading. For the not-so-faint-of-heart, join thousands of others of Pari-rollers for a spin around Paris at night (meet Montparnasse, Fridays at 9:30pm). • Bike Tours: try Mike’s Bikes (especially the nighttime tour) or just rent your own Velib’! • Relax at a hammam: La Grande Mosquée de Paris (there’s a great tea room even if the hammam is not your thing), or the women-only Hammam Pacha (a bit pricey at €35 per entrance—to steam room, soaking pool, sauna, showers, relaxation room—with all treatments extra but worth it if you have a few hours and go with friends or a book for the relaxation room (credit barillaro). You can also have lunch or dinner there. Open until 11pm Thurs & Fri.) Also recently opened is l’Echappée at 64, rue de la Folie Mericourt in the 11th, Tel. 01 58 30 12 50. It’s a bit more modern and upscale than the more traditional and arabesque Hammam Pacha, so it depends on your preference. Though L’Echappée is a bit cheaper as well—€45 includes a 10-15 min gommage (scrubbing) session. L’Echappée has a great restaurant for lunch, light dinner and a Saturday/Sunday brunch as well. • Eurodisney—accessible by public transport (RER) from Paris. —For more info on festivals, holidays, special events, etc. see the World Guides site or Secrets of Paris‘s calendar of events. • For more ideas, check out these Paris blogs: Chocolate & Zucchini (mostly about food! ), Secrets of Paris, David Lebowitz, Paris Conciergerie, Hip Paris Blog, Girls’ Guide to Paris and The Paris Blog. • A number of parks can make for a nice day or half-day trip, especially if you bring along a picnic. Try my favorite parks outside the city: Parc de Sceaux (Sceaux, take RER B south to Parc de Sceaux station, about 30 minutes from St. Michel) and Parc de St. Cloud (Boulogne). • Versailles—best to visit in nicer weather as the gardens are a highlight. Any easy day trip: avoid lines by purchasing a train and château/gardens entrance ticket in one at an SNCF (train) boutique. • Giverny—Monet’s own garden and the inspiration behind a lot of his impressionist paintings. Take the train from St. Lazare to Vernon and rent bikes from the shop right outside the station. It’s about a 4-5 km ride to Giverny. Makes for an easy day trip. • Fontainebleau (château and forest)—about an hour from Paris. The forest has great hiking/biking trails. • Champagne—about an hour or hour and a half from Paris. O Château runs day tours to Champagne (8am-7:30pm). • Loire Valley—only a little over an hour to get to the start from Paris. This article lists some good chateau B&Bs in the Loire. • Brussels/Bruges—Brussels is only 1:20 on the Thalys train, and it’s another 1:30 or so to Bruges (I believe they have some direct trains as well), a beautiful mid-size city great for a day or a whole weekend. With an extra day you can rent bikes and ride in the countryside or along the canal to the Dutch border. • Honfleur, Normandy—Honfleur is about a 2 hour drive (without traffic) and a very cute town near the coast with a harbor and a bunch of shops, restaurants. A bit further are the D-Day beaches (west of Honfleur for the WWII beaches or up to Etretat for rock formations). There are also some beautiful and less traveled regions inland in Normandy, not too far from Paris. • London—2:20 hours or so now on the Eurostar. • Burgundy—an hour to Montbard on the high-speed train (northern Burgundy) or 2 to 2 ½ further south, or you can drive from Paris (2-3 hours). Great wine tasting. • St. Malo—in Brittany, near Normandy border. You can take the train to St. Malo (about 3 hours) or take the train to Rennes (about 2 hours) and rent a car there–that way you can see Mt. St. Michel, Dinan and other nearby towns as well. • Vannes/Auray and the Gulf of Morbihan—about 2h30 on the train, a great weekend escape in good weather for hiking the coastal path (GR34) and visiting some of the nearby villages. • Aix-en-Provence/Avignon—My favorite part of this region is the Luberon (Gordes, Rousillon). It’s 2:45 on the train to Avignon or Aix. • Bordeaux—a bit further than Burgundy (3 hours on high speed train) but great wine tasting. Easy train ride from Bordeaux to St. Emilion (30 minutes or so). • Dordogne—highest concentration of nice little towns and castles anywhere, nice countryside. A bit further though—3 hours on the train to Bordeaux or Toulouse and maybe a 2-hour drive from there. • Nice/Cote d’Azur—best to fly (45 min) if you have less than 3 days (about 5 ½ hours by train). From there you can visit Italy (San Remo), Villefranche, Eze, Saint-Jean-Cap-Ferrat, Antibes, Cannes, Saint Paul de Vence.